Please join planning professionals for a networking event and hear how we can have an impact on issues relevant to Black communities through information sharing collaboration and partnerships. Tamika Butler, Executive Director of the Los Angeles Neighborhood Land Trust, will speak on “Beyond Complete Streets”. Tamika serves as the Executive Director of the Los Angeles Neighborhood Land Trust, a non-profit organization that addresses social and racial equity, and wellness, by building parks and gardens in park-poor communities across greater Los Angeles. Tamika has a diverse background in law, community organizing, communications, and nonprofit leadership. Recently, she was the Executive Director of the Los Angeles County Bicycle Coalition. Prior to leading LACBC, Tamika was the Director of Social Change Strategies at Liberty Hill Foundation, and worked at Young Invincibles as the California Director. She transitioned to policy work after litigating for three years as a public interest employment lawyer at Legal Aid at Work (previously Legal Aid Society-Employment Law Center). Tamika received her J.D. in 2009 from Stanford Law School, and in 2006 received her B.A. in Psychology and B.S. in Sociology at Creighton University in her hometown of Omaha, Nebraska. This year’s conference will be in Reading from October 20-22, with Healthy Communities activities focused on Mond ay, October 21. Please submit your proposal ideas for proposals by March 4 as outlined at https://planningpa.org/events-training/annual-conference/callforpresenters/. 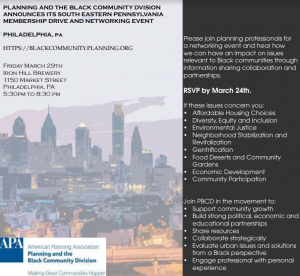 The Healthy Communities in PA Task Force is hosting a second Healthy Communities Day at the 2019 American Planning Association Pennsylvania Chapter (APA PA) Conference. Check out the Chapter’s Healthy Communities in PA Task Force before and after the conference for regularly updated resources on healthy community design. We will post all of the sessions on our website, with our other resources. Get involved throughout the year! You can get involved by joining one of the Healthy Community in PA’s orientation and information sharing calls to find out about previous work and how your interests fit in. Orientation and Information Sharing call typically the fourth Tuesday of each month at 2:00 p.m. The Healthy Communities in PA task force envisions communities in all parts of Pennsylvania being built in a way that makes the healthy choice the easy choice for every resident. The Healthy Communities in PA task force achieves its vision through volunteer efforts by planning and health advocates creating tools and resources to assist partners in promoting healthy community design. The tools and resources are created by working groups of task force topic experts collecting best practices needed by Pennsylvania’s healthy community design partners and to create new partners. 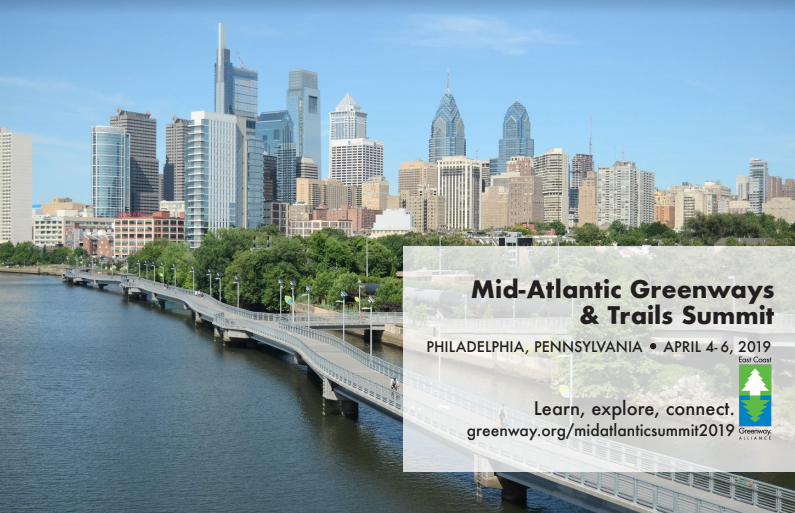 The American Planning Association, Pennsylvania Chapter is committed to sharing these resources and facilitating discussion around healthy community design in Pennsylvania. 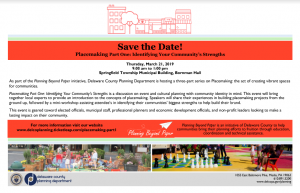 Professional planners from Chester County are invited to attend the spring 2019 Chester County Planners’ Forum from 3 p.m.-5 p.m. April 4 at Phoenixville Borough Hall, 351 Bridge Street, Phoenixville. Email any questions you may have to ccplanning@chesco.org. Older and historic places are an integral part of the identities, cultures, and economies in Pennsylvania’s diverse communities. These places where we live, work, and play can often mean different things to different people, which provides both opportunities and challenges as communities grow and change. How can planners help their communities and clients identify, protect, and enhance these places? This one-day workshop, sponsored by the Pennsylvania State Historic Preservation Office (PA SHPO) and Delaware Valley Regional Planning Commission (DVRPC), will familiarize county, municipal, and consulting planners with core historic preservation programs and concepts and help participants understand how to effectively integrate these ideas into planning processes, documents, and practice. Incentives and tools for historic preservation. Five hours of AICP Certification Maintenance (CM) credits available. Registration is required by Friday, March 8 . The $40 registration fee includes the one-day workshop, lunch, and break refreshments. Doors open at 8:30 AM and the workshop begins at 9:00 and runs through 3:15 PM. *Please note: In the event of inclement weather, the workshop will be held the following day, March 20, at the same location. Please see website for details. For more information, please contact Cory Kegerise, PA SHPO’s Eastern Region Community Preservation Coordinator at ckegerise@pa.gov or 215-219-3824. HCTF’s first racial equity workshop The Impact of Racism and Trauma and Learning How to Work with People Who Have Been Traumatized, will be offered on both Wednesday, January 30th and Tuesday, February 26th from 9:00am to 12:30pm at DVRPC. The workshop will be facilitated by Dr. Jade Logan, Ph.D., ABPP, Assistant Professor of Psychology at Chestnut Hill College and counselor with The Ladipo Group. The workshop agenda, as well as additional information on Dr. Jade Logan and the Ladipo Group, are attached. Registration for a second workshop on Communication Strategies for Discussions about Race, Microagressions, and Unconscious Bias will be announced at a later date. Thanks to all who have RSVP’d so far. We look forward to seeing you! If you have not registered but would like to attend, please visit Ticketleap to register. Limited scholarships are available. Please contact Amy Verbofsky at averbofsky@dvrpc.org for more information.